Christopher Columbus called papaya the “fruit of the angels“. He noticed that the Caribbean natives ate the fruit after huge meals and never encountered any digestive distress. And they were ‘strong’. Papayas are shaped like elongated melons or pears. The flesh is deliciously sweet with a musky undertone, and its texture has a soft melting quality. 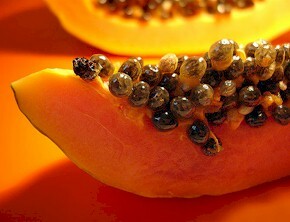 Ripe papaya flesh is a rich orange color with either yellow or pink hues. The nutritional highlight of papaya is a proteolytic enzyme called papain which is an excellent aid to digestion. This enzyme is so powerful that it is said to digest an amazing 200 times its own weight in protein. It assists our body’s own enzymes in assimilating the maximum nutritional value from the food we eat. Papain can be made into an immediate home remedy treatment for jellyfish sting or other wounds, even surgical wounds. The highest concentration of this substance is on the skin of unripe papayas. Cut the skin and apply it directly to the affected area. Papaya is a wholesome fruit, another of my favorite. It is a rich source of anti-oxidant nutrients such as beta-carotene (which is what gives it the orange color; green papaya does not contain this carotene), vitamin A and C and flavonoids, B vitamins, folate and pantothenic acid. It also contains small amounts of the minerals calcium, chlorine, iron, phosphorus, potassium, silicon and sodium. The carbohydrate content in papaya is mainly of invert sugar which is a form of pre-digested food. 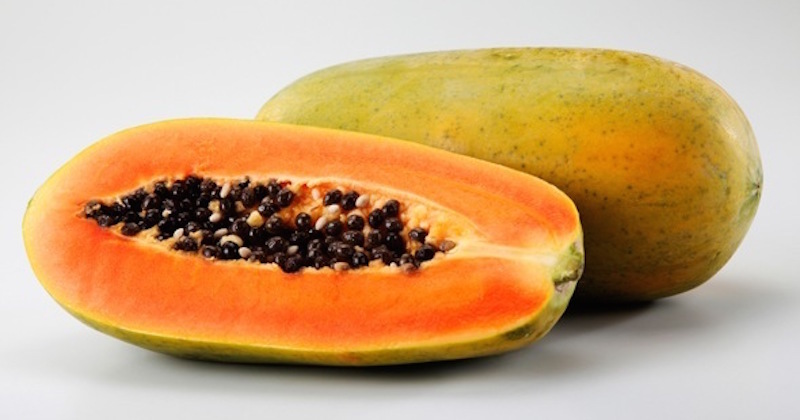 The ripe papaya is endowed with an abundance of energy-boosting natural sugars. The papaya has remarkable medicinal virtues recognized from ancient times. It is not a commonly allergenic food. Being one of the most easily digested fruits, it is an excellent wholesome food for young to old, a rejuvenating choice. Anti-Inflammatory: The anti-inflammatory virtue from the papain in papaya greatly reduce inflammation in diseases such as rheumatoid arthritis, osteoarthritis, gout and asthma. Cholesterol: This fruit not only helps to clean out the digestive system, it is also rich in antioxidants that prevent oxidation of cholesterol build-up in the arteries. Colon Cancer, Prevention Of: The rich fiber in papaya bind to cancer-causing toxins in the colon and is eliminated from the body during bowel movements. Digestive Aid: Papaya is commonly known for its fine and natural laxative virtue which aids digestion. Taken regularly, it can help relieve habitual constipation, bleeding piles and chronic diarrhea. Emphysema, Protection Against: If you are a smoker, or are frequently exposed to secondhand smoke, consume papaya juice regularly for its high vitamin A content. This may save your life as it will highly reduce your lung inflammation. Heart Disease, Protection Against: The three very powerful anti-oxidants in papayas help prevent the oxidation of cholesterol. Oxidized cholesterol forms dangerous plagues that can eventually cause heart attacks or strokes. Intestinal Disorders: The papain in unripe papaya is extremely beneficial for those who are deficient in gastric juice, have excess of unhealthy mucus in the stomach, dyspepsia and intestinal irritation. Menstrual Irregularities: Consumption of unripe papaya juice help to contract the muscle fibers of the womb, resulting in proper and regular menstrual flow. It is especially helpful in cases of menstruation cessation in young ladies due to cold or trauma. Skin Diseases: The juice from unripe papaya is highly beneficial in treating skin disorders like acne and psoriasis. When applied to wounds, it prevents pus formation and swelling. Paste made from unripe papaya when applied to the face, may remove pigmentation or brown spots, and making the skin smooth and delicate. Try it. Spleen Enlargement: Immerse cut ripe papaya in vinegar for a week, then consume twice a day with meals until spleen is normalized. Throat Disorders: Drink honey mixed in fresh juice from unripe papaya regularly over inflamed tonsils for diphtheria and other throat disorders. It dissolves the membrane and prevents infection from spreading. Choose papayas that have reddish-orange skin if you want to eat them within the day of purchase. Avoid fruit that is bruised or has patches of deep orange color which indicates that it is over-ripe. Purchase green papayas only if you intend to cook them as the flesh will not develop its sweet juicy flavor. A papaya can be eaten as it is, with its skin cut. Cut the papaya length-wise, and then into smaller pieces. The sweetest part of the papaya is concentrated on the end furthest from the stem. You may also sprinkle your papaya with fresh lime juice. It adds taste to the fruit. Or, finally, blend it with other fruits like strawberry or yogurt to make a smoothie. Check out also, the amazing benefits of papaya seeds and its cancer-fighting leaves.